This is a MUST SEE documentary for anyone with an interest in workforce development and the future of trade jobs in the United States. 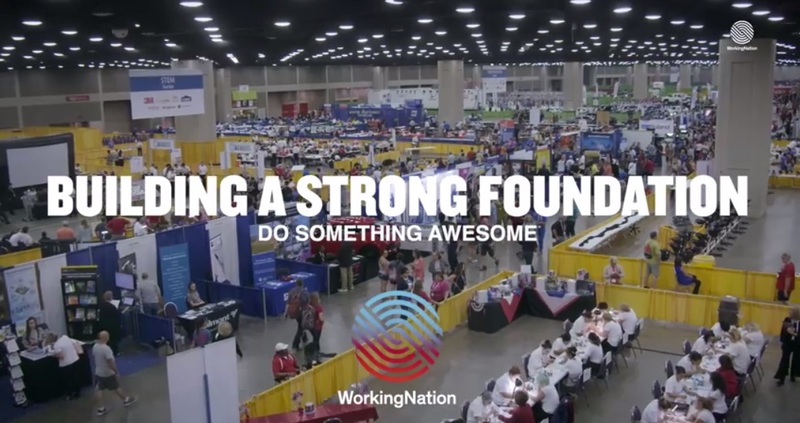 “Building a Strong Foundation: SkillsUSA Prepares the American Workforce” is a new mini-documentary from WorkingNation that follows 20-year-old Logan Thomas and others as they learn and practice in-demand trade skills as part of the SkillsUSA’s TeamWorks competition. The documentary was produced by WorkingNation, a national non-profit campaign working to expose hard truths about a looming unemployment crisis in the United States and bring the country together to create and amplify solutions. In the 5-minute documentary, we learn how SkillsUSA has partnered with education and industry leaders around the country to equip more than 13 million people with the skills and experience to become competitively employed in highly technical trade and service jobs. By highlighting these corporations, not-for-profits and individuals, WorkingNation is providing a wide audience with information on emerging careers, pathways to steady jobs, and successful programs that other organizations can adapt for their respective communities, across multiple industries. Watch every episode of the “Do Something Awesome” series at WorkingNation.com. Founded by philanthropist and venture capitalist Art Bilger, WorkingNation exists to expose hard truths about the looming unemployment crisis and bring the country together to create new jobs for a changing economy. Bilger serves as CEO of WorkingNation and has assembled a team of talented journalists and media and non-profit executives to carry out the mission. WorkingNation’s efforts include a series of original programming from award winning directors and producers as well as other forms of interactive multimedia outreach to everyday Americans. For more information, visit WorkingNation.com.